Piet Mondrian. Victory Boogie Woogie, (1942-44). Gemeentemuseum, The Hague, The Netherlands. How was Mondrian’s Victory Boogie Woogie represented in the 28(+) Painting toward architecture shows across America in 1947-52? Below is a compilation of found documentation across the 28(+) venues of the Painting toward architecture travelling exhibition (as of early January 2018). For the notations provided below, please refer to the full Painting toward architecture compilation for more bibliographic information and source locations. (e) to try to figure out exactly what something appearing on some checklists, Mondrian’s "Lecturn Boogie-Woogie" was specifically referring to. Also, I’ve also included general mentions to "Mondrian" when it wasn’t clear that the writer / source was referring to VBW or other works in the show: Composition (1935 / 1942) and his earlier Pier and ocean (1914). Also, the nature of these 1947-52 sources should be met with some skepticism. An artist foundation director, whom I spoke to last year, describes it best. She recalled an instance whereby an artwork in c. 1950 was on a packing list and also an exhibition list. There was also an installation photo, and the artwork was in the exhibition catalogue. So, all of this evidence provides solid proof, right? Actually, no. It was later learned that the artist, in some sort of dispute, removed the artwork right before the exhibition opening. So, the artwork was actually not on view in the show. With this skepticism in mind, let’s consider the following evidence to try to assess: how was Mondrian’s Victory Boogie Woogie represented in the 28(+) venues of Painting toward architecture? Also, what was said about VBW and its related works made by Perle Fine in articles responding to the show? Victory Boogie Woogie at Venue 1: Wadsworth Atheneum, Hartford, CT, (11 December 1947 - 3 January 1948). > Two (presumed) object lists: in the first, it includes; "Mondrian, Piet - Victory Boogie Woogie (1943)" and "Oil transcription by Perle Fine also to be shown in exhibition". On the second list, the oil transcription is deleted. Murray, Marian. (28 November 1947). The Hartford Times. This is a must-see article. It details, "The original will be shown at the Atheneum", and also that Perle Fine" arranged to make a canvas that would interpret the scheme according to Mondrian’s conception... Miss Fine’s painting will represent it in the traveling exhibition which will tour the country..."
(29 November 1947). The Hartford Daily Courant. "Piet Mondrian" is listed with many artists. Louchheim, Aline B. (December 1947). ARTnews (reprint). The article starts, "Pointing to two Mondrian canvases in her office, Mrs. Burton G. Tremaine, Jr, art director of the Miller Company in Meriden, Conn., addresses its advertising men and engineers." (The paragraph continues with Mrs. Tremaine’s account of this and comparable work impacting upon graphic design and architecture, and the c. 1947 context of developing industrial design at the Miller Co.) Later, Louchheim mentions Victory Boogie Woogie in a simple collection-focused sentence. (1 December 1947). News Bulletin (Wadsworth Atheneum). "One of the most important paintings in the exhibition is Piet Mondrian’s Victory Boogie Woogie, which was completely designed but not entirely translated into paint at the time of the artist’s death in 1944. Even in its incomplete state it shows Mondrian as a great artist who, perhaps more than any other in our time sensed the oneness of architecture and painting, and expressed it in purely geometric terms." "It is peculiarly fitting that this painting should be the focus of the collection, for the Dutch Mondrian was inalterably affected by the flickering patterns of the light in the windows of New York skyscrapers at twilight, which he saw when he came to this country as an old man in exile." Murray, Marian. (c. 13 December 1947). The Hartford Times. "The relation to architecture is obvious in such paintings as... two Mondrians— an early "Construction" and the much-talked-of ’Victory Boogie-Woogie’." (14 December 1947). New York Herald Tribune (reprint). "Mondrian" is mentioned among other listed artists; also "In a lecture at the opening of the exhibition, Henry Russell Hitchcock... showed the influence... of van Doesburg and Mondrian on the Dutch architect Oud." Louchheim, Aline B. (21 December 1947). New York Times (reprint). "The alliance [between art and architects] is most easily seen in the examples by the Dutch painters Mondrian and Van Doesburg. The former’s white canvases, neatly divided by black lines into measured rectangles with assymetrically disposed blocks of red, yellow and blue, were a fountainhead of inspiration for architecture and typographic layouts. Such men as Oud in Holland and Mies van der Rohe in Germany were especially indebted to Mondrian." Smith, Wayne. (28 December 1947). The Republican. "Mondrian" is mentioned among other listed artists. Also Mondrian’s use of Scotch tape on the canvas is mentioned. (19 January 1948). Newsweek. "Miss Hall [who was soon to become Mrs. Tremaine] bought Mondrian’s "Victory Boogie Woogie", an expanse of peripatetic checker markings which the literal-minded ridicule as heartily as typographers admire it." Assessment: At this juncture, I suppose one assumes that the original Victory Boogie Woogie by Mondrian was on view and nothing else related to VBW. The photo seems to me to show the original, but do request a scan of the photo if of interest and see for yourself. VBW at Venue 2: Walker Art Center, Minneapolis, MN, (20 January - 22 February 1948). Photo of Perle Fine’s (presumed) copy of Piet Mondrian’s Victory Boogie Woogie as installed at the Walker Art Center, Minneapolis in January 1948. To the left stands Henry-Russell Hitchcock. Photographer: Dan Berg, Courtesy Walker Art Center Archives, walkerart.org. > As of 9 January 2018, no known exhibition checklist and packing lists have survived. An additional element, a "log-in" artwork entries book, which may show a partial list of works in the PtA exhibition, does not list Mondrian’s VBW or Perle Fine’s "copy / oil transcription". > Installation photo. A black-and-white photo presumably showing the copy (oil transcription) of Mondrian’s Victory Boogie Woogie by Perle Fine. (See above). > (14 January 1948). Press release. "Mondrian" is mentioned in a list of artists. (18 January 1948). Star Tribune announcement. "Mondrian" is listed among other artists. Sherman, John K. (28 January 1948). Minneapolis Star. "Here... is a wide range of approach and subject, ranging from Paul Klee’s mystic doodles to Piet Mondrian’s rigid and pure rectangles." Assessment: It appears that the oil transcription by Perle Fine was on view. VBW at Venue 3: Akron Art Institute (now the Akron Art Museum), Akron, OH, (9 - 28 March 1948). > As of 8 January 2018, no known installation photos, exhibition checklist, and packing lists have survived. > (March 1948). Invitation. "Paintings by... Mondrian", not specified. Tucker, Peri. (7 March 1948). Akron Beacon Journal. ".... More recent works by such artists as Mondrian, Davis, and Pereira are included for the effect they may have on future architecture..."
Bruner, Louise. (12 March 1948). Cleveland News. "... There are... bold perpendicular and horizontal lines in the Pierre [sic] Mondrians." Assessment: At this juncture, a complete mystery. One could make assumptions that works in one show were shipped to another, but as the evidence across the 28(+) venues shows, some works were sent in, and some returned, from venue to venue. Also, occasionally works with certain damage arrived, but then were not put on view. VBW at Venue 4: Baltimore Museum of Art, Baltimore, MD., (4 - 28 April 1948). > As of 8 January 2018, no known installation photos or packing lists have survived. > Object list (presumably). Victory Boogie Woogie by Piet Mondrian is on this list. > (3 April 1948). Press release. "... A further precision, one of mathematical proportion, the symmetrical balance of composition, is on the black lines and regulated statement of a classical Mondrian." (April 1948). Baltimore Museum of Art News. "... A further precision, one of mathematical proportion, the symmetrical balance of composition, is on the black lines and regulated statement of a classical Mondrian." > (24 April 1948). Letter: Fritz Glarner to Katherine Dreier. In this letter, according to Troy, Glarner was very unhappy with Perle Fine’s "interpretation" [but this probably is the "copy / oil transcription"]. > (c. 1948). Label for Fine’s "interpretation" [but this probably is the "copy / oil transcription"]. None of the media coverage mentions the artwork or Mondrian. Assessment: Given the evidence put forth by Nancy Troy, it seems that the work on view was the "copy / oil transcription". VBW at Venue 5: Milwaukee Art Institute (now the Milwaukee Art Museum), Milwaukee, WI, (7 May - 6 June 1948). > As of 8 January 2018, no known installation photos, exhibition checklist, and packing lists at the Milwaukee Institute / Art Museum have survived. (April 1948). Milwaukee Art Institute Gallery Notes. "Mondrian" is mentioned in a list with other artists. Stover, Frances. (16 May 1948). Milwaukee Journal. "There are paintings by Picasso, Braque, Mondrian, Leger..." No Mondrian artwork specified. Chermayeff, Serge. (June 1948). Arts and architecture. "The basic affinity of the rectilinear universe recognizable in the work of Mondrian, van Doesburg, van der Rohe, Gropius and the early Breuer is followed by the simultaneous development of a new world of form expressed through the work of Arp, Miro, Aalto, Corbusier and Tekton." VBW is not specified. Also, this article is more overall thematic than specific to the works on view in Milwaukee. Assessment: Based on this evidence, it seems actually the "copy / oil transcription" of VBW by Perle Fine was on view in Milwaukee, not the "interpretation" or original, given the dates of the exhibition and letter. But a new piece of evidence could turn this upside down. I assume that the original VBW was not on view in Milwaukee given its distance from Connecticut / New York and the artwork’s fragility. Also, note that the Miller Co. staff member that sent the documentation might have also been confused by the "original", "copy / oil transcription", "interpretation", and "lecturn" distinctions, like many of us are, at least initially. VBW at Venue 6: California Palace Legion of Honor, San Francisco, CA, (1 July - 1 August 1948). > As of 8 January 2018, no known exhibition checklist has survived. > One installation photo showing presumed interpretation of Victory Boogie Woogie by Perle Fine. California Palace Legion of Honor exhibition archive. > Note card. Lecture announcement: "From Mondrian to Miro. An analysis of the Miller Collection. Series of Four Lectures by Dr. Jermayne MacAgy. Wednesdays at 10:30 A.M., July 7, 14, 21, 28". (June 1948). Architect and engineer. "Mondrian" just mentioned by name among other artists and in an abstract Dutch art-to-architecture statement. Dungan, H. L. (11 July 1948). Oakland Tribune. "Mondrian" listed among other artists represented in the show. Frankenstein, Alfred. (25 July 1948). San Francisco Chronicle. "Piet Mondrian" just mentioned by name among other artists. Assessment: The "interpretation" of VBW by Perle Fine was probably on view. This is an excellent example of how the imprecisions in the language can easily cause confusion. I am basing my assertation that the work on view was Fine’s "interpretation", versus the "copy / oil transcription", based on the look of the work in the photo. Perhaps the Miller Co. shipped the "interpretation" to San Francisco, and Milwaukee sent the "copy / oil transcription" back to Connecticut, and the assumption that the "interpretation" was completed in June 1948. If of interest, do request a photo from the DeYoung / Legion of Honor’s exhibition archive. VBW at Venue 7: Los Angeles County Museum of Art, (7 August - 6 September 1948). > As of 8 January 2018, no known installation photos, exhibition checklist or packing lists have survived at LACMA. > (15 June 1948). Items received by the California Palace Legion of Honor via Milwaukee Institute; document sent to the Miller Company: interpretation of VBW by Perle Fine. Boyd, E. (August 1948). Arts & Architecture. In this exhibition review, a mention, "Some of the most familiar milestones in the progress of our art are here, such as... Perle Fine’s interpretation of ’Victory Boogie Woogie’..."
Assessment: See assessment in above section, California Palace Legion of Honor. Most likely the "interpretation" of VBW by Perle Fine was received and on view. But a new piece of evidence appearing could change everything. VBW at Venue 8: Portland Art Museum, OR, (13 September - 3 October 1948). > As of 8 January 2018, no known installation photos have survived at the Portland Art Museum. > Object "list sent by Portland, Oregon". (Cincinnati Art Museum archives): "Fine - Victory Boogie Woogie"; "Mondrian - Lecturn Boogie Woogie". (September 1948). Portland Museum of Art Bulletin. "Mondrian" is listed among other artists. (12 September 1948). Journal (Portland, OR). "Mondrain" [sic] is listed among other artists. Jones, Catherine. (12 September 1948). The Sunday Oregonian. "Mondrain" [sic] is listed among other artists. Assessment: the "interpretation" of VBW by Perle Fine was probably on view, as was the "photographic lecturn", according to this limited evidence. 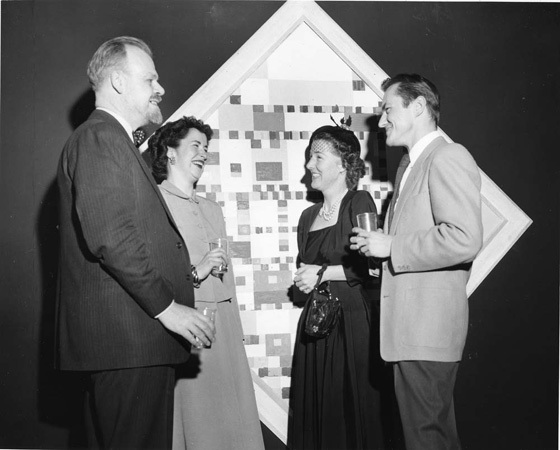 VBW at Venue 9: Cincinnati Art Museum, organized by the Cincinnati Modern Art Society, Cincinnati, OH, (11-31 October 1948). > As of 10 January 2018, no known installation photos have survived. > Brochure with artwork list: "FINE, Perle - Interpretation of Piet Mondrian’s Victory Boogie Woogie, 1947"; "MONDRIAN, Piet - Lecturn Boogie Woogie", Photographic lecturn. > "Official checklist": "Fine, Perle - Interpretation of Piet Mondrian’s Victory Boogie Woogie (1947)"; "Mondrian, Piet - Lecturn Boogie Woogie". > "Additions to come" with list of works: "Mondrian, Piet - Victory Boogie Woogie (1943). Oil and scotch tape on the canvas". > "Checklist": "Fine, Perle - "Interpretation of Piet Mondrian’s Victory Boogie Woogie (1947)"; "Mondrian, Piet - Lecturn Boogie Woogie". > "Damage" (condition assessment): "OK: FINE - Victory Boogie Woogie (Interpretation by Perle Fine)"; "base loose and dirty: Mondrian: Lecturn Boogie-Woogie". The one article found for the Cincinnati venue does not mention Mondrian or Victory Boogie Woogie. ASSESSMENT: Either Perle Fine’s "copy / oil transcription" or "interpretation" of VBW was on view; regarding "Lecturn Boogie Woogie", see Houston and University of Michigan venues below. Venue 10: Knoedler Art Galleries, New York (for the benefit of the Scholarship Fund of the Institute of Fine Arts, New York University, (2 - 20 November 1948). > As of 10 January 2018, no known installation photos or packing lists have survived. > (c. November 1948). Brochure / exhibition checklist: "Mondrian, Piet. Victory Boogie-Woogie, 1943. Oil and scotch tape on canvas. "; Fine, Perle. "Interpretation of Piet Mondrian’s Victory Boogie Woogie, (1947)". Louchheim, Aline B. (2 November 1948). New York Times: "There are examples of work which had direct influence on the development of modern architecture. Such are the geometric non-objective early canvases of Mondrian (the big, unfinished ’Victory Boogie Woogie’ represents a later, somewhat different trend). These meticulously arranged lines and rectangles served as inspiration for typography and linoleum design as well as for the facades of buildings in Holland in the Twenties." Assessment: The evidence suggests that Mondrian’s Victory Boogie Woogie and either Perle Fine’s "copy / oil transcription" or her "interpretation" were in the show. Painting toward architecture book / exhibition catalogue media launch, (c. October - December 1948). (1948). Painting toward architecture. The Miller Company Collection of Abstract Art; essay by Henry-Russell Hitchcock; foreword by Alfred H. Barr, Jr.; introduction by Burton Tremaine; acknowledgements by art director Emily Hall Tremaine; book design by Bradbury Thompson. New York; Duell, Sloan and Pearce; 118 pp. > On page 32, Hitchcock writes about VBW : "Mondrian however, like a theoretical physicist, really pursued his aesthetic research for its own sake. The application to architecture of the implications of the latest and richest work he did in America just before his death remains still a potentiality (See p. 81)." (18 November 1948). Meriden Daily Journal. "Mondrian" is mentioned among other artists. Dwight, Edward H. (20 November 1948). Cincinnati Enquirer. "Mondrian" is mentioned among other artists. Hunter, Sam. (9 January 1949). New York Times. "Mondrian" is mentioned among other artists. VBW at Venue 11: Boston Institute of Contemporary Art, (16 December 1948 - 15 January 1949). > As of 8 January 2018, no known installation photos have survived. > Exhibition checklist in Institute of Contemporary Art, Boston archive: "Fine, Perle - Interpretation of Piet Mondrian’s Victory Boogie Woogie (1947)". Also, "Lecturn Boogie-Woogie". Clue: handwritten, below this title, "photographic lecturn"; also type of case for transport, material: "fibre". Driscoll, Edgar J. (19 December 1948). Boston Sunday Globe. Driscoll only mentions "the Dutch abstractionist, Piet Mondrian", within a list of selected artists, with no mention of specific artworks. (26 December 1948). Boston Sunday Globe. This is a must-see. In a short visual-based announcement, a small photo of Piet Mondrian’s Victory Boogie Woogie, with photo caption is placed in between photos of a design and sculpture. To the left is the Dudok-designed town hall in Hilversum, The Netherlands. To the right is Georges Vantongerloo’s architectural-looking Construction. The two images are credited to MoMA. It is not believed that a photo mural of the town hall and the sculptural Vantongerloo were included in the exhibition. Hitchcock, Henry-Russell. (c. October - December 1948). Essay in Painting toward architecture, p. 30. "... In the earlier post-war years around 1920, the Dutch artist Van Doesburg and the sculptor Vantongerloo, if not perhaps Mondrian, were working more consciously and directly toward architecture than anyone in Paris except Le Corbusier himself." Hitchcock later continues in the paragraph, "Indeed the influential work of the Dutch architect, Dudok, whose early buildings were quite suggestive of Vantongerloo’s sculpture, has improved in quality since its plastic complexity became less willful." So, Hitchcock’s earlier take seems to have shaped the Boston Sunday Globe announcement above. (January 1949). Architectural Record. The only relevant mention regarding VBW in this feature on the show and Hitchcock’s book is: "In the earlier postwar years around 1920, the Dutch artist Van Doesburg and the sculptor Vantangerloo, if not perhaps Mondrian, were working more consciously and directly toward architecture than anyone in Paris except Le Corbusier himself." Wight, Frederick S. (29 January 1949). Christian Science Monitor. Wight only mentions "Mondrian" in passing in relation to Oud, but the article is definitely worth reviewing as it talks about overall themes. VBW at Venue 12: Yale University, New Haven, CT, (19 January - 13 February 1949). > As of 8 January 2018, no known installation photos, exhibition checklist, or packing lists have survived. > Exhibition checklist in Institute of Contemporary Art, Boston archive: handwritten notations to the left of the checklist indicate where works after the exhibition were shipped: "N.H." (New Haven); "Col" (Columbus). Concerning VBW, the "interpretation" of VBW by Perle Fine was sent to New Haven, and "Lecturn Boogie-Woogie" was sent to "Meriden" (presumably the Miller Co.). > (1948). Letters EHT to Charles H. Sawyer, Yale director and vice-versa (22 & 23 NOV 1948) indicate that due to an exhibition size constraint, only a scaled-back version of the show could be exhibited. Assessment: It seems from this limited information that Perle Fine’s "interpretion" of VBW may have been in the exhibition. Conceivably, Mondrian’s VBW and the "photographic lecturn" could have also been exhibited, but there is no evidence to support this claim at this juncture. VBW at Venue 13: Columbus Museum of Art, Columbus, Ohio, (18 February - 13 March 1949). > Exhibition checklist in Institute of Contemporary Art, Boston archive: handwritten notations to the left of the checklist indicate where works after the exhibition were shipped: "N.H." (New Haven); "Col" (Columbus). The "interpretation" of VBW by Perle Fine was sent to New Haven; the "photographic lecturn" was sent to Meriden. Both works could conceivably have been later sent to Columbus. Royer, Ed. (27 February 1949). Columbus Citizen. While Royer writes, "the most important show of the year in Columbus", there’s no mention of VBW. Assessment: At this juncture, a complete mystery. VBW at Venue 14: George Walter Vincent Smith Art Museum, Springfield, MA, (27 March - 17 April 1949). > As of 8 January 2018, no known installation photos, exhibition checklist, or packing lists have survived. Also, no found VBW media mentions, but found coverage is very thin. VBW at Venue 15: Rhode Island School of Design, Providence, RI, (26 April - 24 May 1949). > As of 8 January 2018, no known installation photos have survived. No media coverage on the show was found so far except for one listing. > However, there’s some other good documentation. On an undated packing list (from Miller Co.); another copy of the undated packing list with notations about the condition of works received; (21 April 1949). Objects received document— from the Miller Company— by RISD Museum; the following is stated. (a): Mondrian’s Victory Boogie Woogie is crossed out on both packing list copies, and not listed in the objects received document. (b): Perle Fine’s "interpretation" of VBW is listed on one of the packing lists; "copy" is noted on both packing lists; on the objects received document, "copy" is stated. (c): Mondrian’s Lecturn Boogie-Woogie is listed on both packing lists, and the objects received document. On the second packing list, handwritten, the "cover in bad shape" seems to be written. Assessment: From this limited evidence, and given the timing and presumed preference for the "interpretation" over the "copy / oil transcription", the "interpretation" was probably in the show. The photographic Lecturn Boogie-Woogie seems as if it would be in the show, but consider the condition received, and see the documentation concerning the next venue. VBW at Venue 16: Smith College, Northampton, MA, (1 June - 26 June 1949). > As of 8 January 2018, no known installation photos have survived. No media coverage on the show, or listings, were found. > However, there’s some good documentation about what was received: (25 May 1949) Objects sent document —from RISD Museum to Smith College; and (3 June 1949) Items received document— by Smith College from RISD Museum. (a): Mondrian’s Victory Boogie Woogie is not on the sent or received document, but in theory, it could have been sent by the Miller Co.
(b):The above documentation states: the copy of VBW by Perle Fine was sent; it is however not on the received document. (c); The above documentation also states: the interpretation of VBW by Perle Fine was received; it is however not on the sent document. On the received document, "(photo)" is after Lecturn Boogie Woogie; the object is also on the sent document. Also, the surviving "items sent document" appears incomplete, given that the "items received document" details photo murals while the former does not. VBW at Venue 17: Memorial Art Gallery, University of Rochester, Rochester, NY, (30 September - 24 October 1949). > Consider exhibition dates for Piet Mondrian: Paintings 1910 through 1944 at Sidney Janis Gallery, New York (10 October - 12 November 1949). (See below.) Mondrian’s Victory Boogie Woogie is understood to be in that show. > As of 11 January 2018, no known installation photos, exhibition checklist, and packing lists have survived. (October 1949). Gallery notes: "Mondrian" is mentioned among other artists. Meisel, Bertha. (14 October 1949). Tower Times: "A particularly interesting part of the exhibit is a detailed diagrammatic analysis of Piet Mondrian’s ’Victory Boogie Woogie’. The painting is composed of a series of blue, red and yellow rectangles on a diamond-shaped canvas. The diagrammatic analysis illustrates the effects of height, depth, and unity that can be achieved by certain colors in certain positions." Assessment: With the assumption that Mondrian’s Victory Boogie Woogie was in the Sidney Janis Gallery show, it would seem that Perle Fine’s "copy / oil transcription" or "interpretation" were in the Rochester show to accompany the charts mentioned twice in the media coverage. Exhibition including a key PtA artwork, Victory Boogie Woogie by Piet Mondrian, but not part of the Painting toward architecture traveling exhibition. Piet Mondrian: Paintings 1910 through 1944 at Sidney Janis Gallery (10 October - 12 November 1949). VBW at Venue 18: Greenbrier Hotel, White Sulphur Springs, WV (during American Institute of Architects, Middle Atlantic District Conference), (4 - 5 November 1949). Consider exhibition dates for Piet Mondrian: Paintings 1910 through 1944 at Sidney Janis Gallery, New York (10 October - 12 November 1949). (See above.) Mondrian’s Victory Boogie Woogie is understood to be in that show. > As of 11 January 2018, no known installation photos (but see next entry), exhibition checklist, and packing lists have survived. (December 1949). Journal of the American Institute of Architects. This is a must-see: Photos of artworks in the background of a group portrait shot: partial views of chart(s) by Perle Fine concerning Victory Boogie Woogie and presumed "copy / oil transcription" or "interpretation" of VBW by Perle Fine. Walker, Ralph (AIA President). (February & March 1950). The architect as a modern, part I and II. Journal of the American Institute of Architects. ["An address before the meeting of the West Virginia Chapter and its guests at White Sulphur Springs, Nov. 5, 1949."] This is a must-see: "If I may be forgiven, Painting toward architecture makes me think of a ‘bull in someone else’s china shop’". Walker gave the speech with the artworks presumably all around him. However, he doesn’t specifically mention VBW or Mondrian. Here, if an audio-recording or video of the speech ever emerged, it would capture his tone and the audience’s reaction. Assessment: Either Perle Fine’s ’copy / oil transcription’ or ’interpretation’ of VBW was on view, as well as Fine’s chart(s). VBW at Venue 19: Georgia Tech Hightower Textile Building, Atlanta, GA (sponsored by Georgia Tech School of Architecture and the Architecture Society), (14 November - 12 December 1949). (18 November 1949). The Technique (Georgia Tech newspaper): "Mondrian" is mentioned in one sentence, and "black lines" in a second. So, perhaps this is referring to Composition 1935-42 and not Victory Boogie Woogie. Assessment: At this juncture, it is a complete mystery. An article says that the show came from the architects conference in West Virginia, but there are very limited details about the works on view at that site. One could assume the works were shipped on to the Houston venue, but there’s a possible Cuba venue in between. Also, given a possible three-week gap between the Atlanta and Houston shows, it is possible works were sent back to the Miller Co., and/or additional works were sent on to Houston by the company. Unlikely, but possible unknown venue (between 13 December 1949 - 7 January 1950) of Painting toward architecture. (9 November 1949). Agnes Scott News. This report (listed in the Georgia Tech) articles section states: "An exhibition of the collection in Cuba is planned for the near future." However, nothing has been found yet. VBW at Venue 20: Contemporary Art Museum Houston, TX, (8 January - 2 February 1950). > As of 8 January 2018, no exhibition checklist and packing lists have been located or reviewed. However, see the material on the overall PtA compilation that has not yet been received or reviewed. Holmes, Ann. (8 January 1950). Houston Chronicle. While economically describing some artworks, Holmes playfully writes, "... and Piet Mondrian’s "Victory Boogie Woogie" might appear to be a better kitchen linoleum than a ’painting’." Billfaldt, Patsy. (undated). [Unattributed press cutting]. "Mondrian" is mentioned in a sentence. Assessment: Inclusion of Perle Fine’s chart— in the show, confirmed. Mondrian’s Victory Boogie Woogie, probably not. Perle Fine’s "interpretation" of VBW, or conceivably the copy / oil transcription, unknown. Possibly Lecturn Boogie-Woogie in the far background. In this installation shot, some sort of representation of Victory Boogie Woogie appears to be in the far background above. Is it the mysterious photographic lecturn? To the right, one can see an analytical chart of VBW by Perle Fine. As a sidenote, looking above the chart, one can see side views of the photo murals on the interior sloped ceiling. One of these is the Schröder House (1924) in Utrecht designed by Gerritt Rietveld. VBW at Venue 21: Isaac Delgado Museum of Art (now the New Orleans Museum of Art) and the Arts and Crafts Gallery, Royal Street, New Orleans, LA, (19 February - 19 March 1950). > As of 8 January 2018, no known installation photos, exhibition checklist, and packing lists concerning the two venues have survived. (20 February 1950). Times-Picayune. Only an abstract mention regarding Mondrian: "...Mondrian and Arp show works that are the ultimate in abstract division of space..."
VBW at Venue 22: U-T Audigier Gallery, Library Buildings, University of Tennessee, Knoxville, (2 - 14 April 1950). > As of 8 January 2018, no known installation photos, exhibition checklist, and packing lists have survived. There also is no mention of VBW in the limited media coverage. VBW at Venue 23: Museum of Art, University of Michigan, Ann Arbor, MI, (23 April - 14 May 1950). > As of 9 January 2018, no known installation photos have survived. > (c. April 1950). Four labels. These are a must-see. One describes Perle Fine’s "completion" of VBW; a second shows Perle Fine’s "Copy of Victory Boogie-Woogie" (1947-48); a third shows Perle Fine’s "Interpretation of ’Victory Boogie-Woogie’ (1947); a fourth has "Piet Mondrian - Victory Boogie Woogie - 1944". The fourth has a two-paragraph text, including, "At reduced size, as in the photograph, the overlay of tape is not conspicuous..."
> (c. April 1950). Some sort of exhibition checklist: crossed out in red: "Fine, Perle - Interpretation of Piet Mondrian’s Victory Boogie Woogie, 1947", in red, above it, "Copy". Crossed out in red: "Lecturn - Victory Boogie Woogie" (and handwritten below and crossed out again in red); also listed a third time and crossed out in red; Fine Perle - Copy of "Victory-Boogie Woogie" 1947-48, oil and scotch tape on canvas". > (c. April 1950). Packing list of some kind: "OUT - Mondrian. Victory Boogie Woogie"; IN - Mondrian. Victory Boogie Woogie (copy)"; "OUT - Mondrian. Victory Boogie Woogie (Interpretation)"; "OUT - Mondrian - Lecturn Boogie Woogie"; checked off - "Mondrian - Boogie Woogie explanatory charts". > (c. April 1950). Some sort of handwritten list of artworks: "Fine. Copy of VBW"; "Mondrian. Victory Boogie Woogie"; "Explanatory charts for Mondrian’s Victory Boogie Woogie". (20 April 1950.) Ann Arbor News. "Mondrian" is mentioned among a list of artists. Forsyth, George M., Jr. (25 April 1950). Ann Arbor News. "Mondrian’s great ’Victory Boogie Woogie’ is a calm architectural exploration, conducted with contrapuntal care like a visual ’Art of Fugue’. The progress through space is not only across this canvas but also into it, because the color areas hold their relative place in depth like descending stairs". Enggass, Robert. (Fall 1950). College Art Journal. Enggass makes reference to the Miller Co. and Victory Boogie Woogie in his article arguing about the "Aesthetic limitations of non-objective painting". He writes: "... In a similar way, Piet Mondriaan... gives his works such musical names... Victory Boogie Woogie, for example, owned by the Miller Company of Meriden, Conn., is exhibited around the country (in a version posthumously completed by others) with the accompaniment of twelve large and elaborately labled charts which explain the painting’s design..."
(13 May 1950). The Michigan Daily. "Mondrian" is mentioned among a list of artists. Assessment: Again, installation photos would help clarify. It seems first that one or more of Perle Fine’s charts were exhibited, and either the "copy / oil transcription" or the "interpretation" was on view. The photograph of VBW, reduced in size, specified in the label may indeed be the mysterious "lecturn". If so, what then is the representation in the Houston installation? VBW at Venue 24: Memorial Union, University of Wisconsin-Madison, WI, (sponsored by the Madison Art Association with the cooperation of the Union Gallery Committee), (23 May - 14 June 1950). > As of 9 January 2018, no known installation photos, exhibition and packing lists have survived. There also is no mention of VBW in the extensive media coverage. > (c. May 1950). On program sheet: "Fine, Perle, Copy of Victory Boogie Woogie, oil and scotch tape on canvas, 1947-48". (13 May 1950). Capital Times. "Mondrian" is mentioned among other artists. (14 May 1950). Wisconsin State Journal. "The blending of the two fields is graphically pointed out in the coming exhibition in paintings by the Dutch artists Mondrian and Van Doesburg. The former’s carefully designed geometrical paintings with white space cut by black lines and blocks of primary color have served as inspiration for both architects and typographical layout artists." (c. 20 May 1950). Capital Times. "Mondrian" is mentioned among other artists. (21 May 1950). Painting... Wisconsin State Journal. "Mondrian" is mentioned among a list of artists. (21 May 1950). Reception... Wisconsin State Journal. "Mondrian" is mentioned among other artists. (23 May 1950). Hold reception for art show. Daily Cardinal. "Mondrian" is mentioned among other artists. > No photos accompany the article. (24 May 1950). Daily Cardinal. "Mondrian" is mentioned among a list of artists. Assessment: With no installation photos, whether the "copy / oil transcription" or "interpretation" by Perle Fine was exhibited, it’s not completely clear. Exhibition including a key PtA artwork, Victory Boogie Woogie by Mondrian, but not part of the Painting toward architecture traveling exhibition. Recent acquisitions at Museum of Modern Art, New York (25 July - 5 November 1950). Possible unknown venue(s) (between 15 June 1950 - January 1951) of Painting toward architecture. 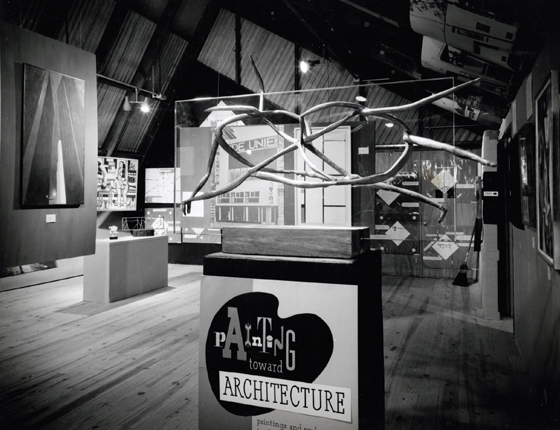 VBW at Venue 25: Person Hall Gallery, University of North Carolina, Chapel Hill, NC, (c. 21 January - 25 February 1951). > (1950-51). Various documentation in UNC library special collections. Packing list lists "Mondrian - Victory Boogie Woogie (Interpretation)". (27 January 1951). News and Observer. Photo of artwork attributed to be VBW with Serge Chermayeff and others in front of the artwork. Mention of the artwork in a sentence. (4 February 1951). Rocky Mount Evening Telegram. "Mondrian" is listed among other artists. Assessment: Given the packing list and the newspaper photo, it seems that the work on view was the "copy" or "the interpretation". VBW at Venue 26: Parthenon, Nashville, TN, sponsored by the University of Tennessee extension center, (4 March - 6 April 1951). > As of 8 January 2018, no known installation photos, exhibition checklist and packing lists have survived. (4 March 1951). The Tennessean. In this short announcement, "Mondrian" is mentioned among other artists. Possible unknown venue(s) (between 30 April - 28 October 1951) of Painting toward architecture. Please note that to date, no information has been located to indicate that VBW or its representations, or any Mondrian works, were at the 22 - 29 April 1951 Cornell University Miller Co. art show. Not part of PtA exhibition, but of interest: "Design as a function of management" design conference, Aspen, Colorado (28 June - 1 July 1951). > Here, at the inaugural conference organized by Walter Paepcke, Burton Tremaine was invited to speak about the art/design work at The Miller Company. This conference is known for its importance in design history. Middleton, R. Hunter & Ebin, Alexander. (c. 1951). IMPRESSIONS... In this conference summary document, it is said that Tremaine discussed the Miller Co. art collection and the travelling PtA exhibition among other company design and business activities. VBW is not specifically mentioned. Assessment: More information about Tremaine’s speech is needed, perhaps locating a transcript of it or maybe a video, to determine if VBW was specifically mentioned or shown at the conference. At this juncture, it’s also possible that Tremaine spoke at later conferences in Aspen or similar ones elsewhere. Scheips, Marguerite T. (Research by Weathers, Allen L.) (1995). 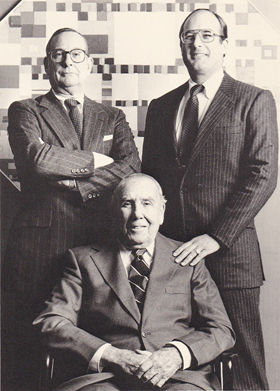 The Miller Company, the first 150 years: The story of a successful American business, 1844-1994, p. 153: photo below. Photo showing three generations of Tremaine leadership at the Miller Company, Meriden, CT, with Perle Fine’s oil transcription (copy) or "interpretation" of Victory Boogie Woogie in the background. Burton Tremaine who led the PtA era of the company is seated. This photo was taken in the mid-1980s in the company’s boardroom. Photo courtesy The Tremaine Family. Fast forward: in addition, the role and impact of VBW at the Miller Co. might be considered. Above is a b/w photo from their corporate history book published in 1995. The copy of VBW or "interpretation" by Perle Fine was apparently hung in the Miller Co. boardroom some time after the travelling exhibition, until at least the mid-1980s when the above photo was taken. It could be argued, to some extent, that the work visually inspired certain people in the room, and the work was a reminder of the PtA-era of the company (1945-55). (1984). The Tremaine Collection - 20th Century Masters: The spirit of modernism [exhibition catalogue]. Victory Boogie Woogie is on the cover and discussed in the text. (2007). Louise Lawler: The Tremaine pictures 1984-2007 [book / exhibition catalogue]. [not in PtA compilation]. BFAS Blondeau Fine Arts Services, Geneva, CH. An installation photo of Victory Boogie Woogie in the 1984 Tremaine Collection show in Hartford is the first photo in the text, and the photo work was presumably exhibited in the Geneva exhibition (p. 11). (Or see the photo on Christie’s website.) On p. 34 is a photo showing a partial view of VBW in the Tremaine’s New York flat. Overall, six photo works by Lawler with VBW are shown on pp. 87-91. (2014). 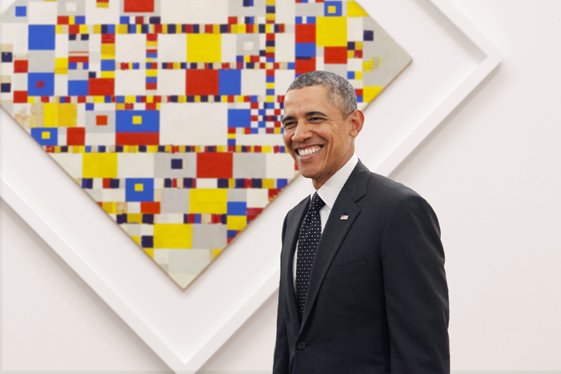 Former US President Barack Obama photographed with Piet Mondrian’s Victory Boogie Woogie at the Gemeentemuseum, The Hague, The Netherlands. Photo courtesy The Gemeentemuseum, The Hague. Lastly, in 2014, then-US President Barack Obama was photographed with Victory Boogie Woogie while visiting the Netherlands. Search online for various related photos published in news media across the Netherlands and Dutch-speaking Belgium at that time, and possibly beyond the Dutch language border. VBW has been positioned in the background for different kinds of photographic portraits. Now back to Painting toward architecture in 1951 and the next exhibition. Venue 27: Dwight Hall, Mt. Holyoke College, South Hadley, MA, (29 October - 17 November 1951). (26 October 1951). The Mount Holyoke News. The article previews the exhibition. "Mondrian" is briefly mentioned twice in the abstract. No specific works are mentioned. Assessment: There is no evidence confirming Victory Boogie Woogie, any VBW representations by Perle Fine, or the photographic lecturn were in the exhibition. (3 December 1951 - 23 January 1952). Paintings from the Miller Company Collection. Smith College Museum of Art, Northampton, MA. > As of 8 January 2018, no known installation photos exhibition checklist, and packing lists have survived. > (24 September 1951). Letter: EHT to Henry-Russell Hitchcock: "The following pictures will not be available at this time... (4) Mondrian, Piet - ’Victory Boogie-Woogie’". > (September 1951). Requested artworks list sent by Smith College. No VBW or VBW-related works are listed. Assessment: It appears that Mondrian’s Victory Boogie Woogie was not in the show; the related VBW works mentioned above, could have been in the show, but it appears they weren’t requested. 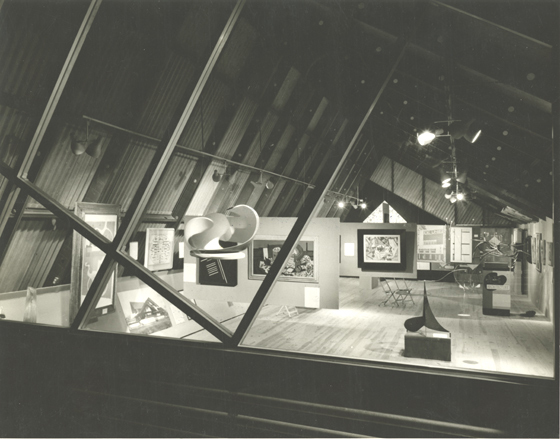 VBW at Venue 28: Farnsworth Art Museum, Wellesley College, Wellesley, MA, (c. 8 May - 1 June 1952). > As of 8 January 2018, no known installation photos, exhibition checklist and packing lists have survived. The correspondence received does not specify any Mondrian or Mondrian-related artworks in the show. > (c. 1984). Documentation: Overview and dates  On this document, "All paintings in collection were exhibited at the [Farnsworth] Museum, Wellesley College in Mass. and were returned by 6/1/52." However, it is unclear exactly when this document was made, who was consulted, and if it was fact-checked. Teasdale, Molly. (15 May 1952). Wellesley College News. "... Mondrian also creates a mood in his Victory Boogie Woogie. The bright colors and pattern of small squares working across and up and down, sprinkled with larger squares, suggest the syncopated, beating rhythm of jazz. Its color lends excitement in the clear bright blues, red, yellows." Assessment: It does indeed seem possible that Mondrian’s Victory Boogie Woogie was exhibited at Wellesley, although the writer could have been referring to the copy or interpretation of Victory Boogie Woogie by Perle Fine, or editorial cut that specification out prior to publication. Further evidence is needed. Other VBW representations by Perle Fine, as well as the photographic lecturn, could also possibly have been in the show. In theory, there could be possible unknown venue(s) of Painting toward architecture after 2 June 1952 but this is unlikely. This concludes the survey of largely newly found material in 2016-17 concerning the Painting toward architecture exhibition and the focus on Mondrian’s Victory Boogie Woogie, the copy / oil transcription of the artwork by Perle Fine, the "interpretation" by Perle Fine, the analytical charts, and the mysterious "lecturn". What results based on the review of material above is: well over a dozen Modern mysteries. For more material gathered after this date and not part of this shortlisted VBW compilation, see the PtA-wide compilation: Painting toward architecture: Documentation and historical information. If there is no "*" after the title of the article, checklist, etc., that information was not included in the above shortlist. I wish those success who pursue to learn more to solve the exhibition mysteries, and long live interest in Painting toward architecture and Victory Boogie Woogie. Robert Preece is a Contributing Editor of Sculpture magazine and a Visiting Researcher at the School of Architecture, Technical University - Delft in the Netherlands. [FN2] (a:) Troy, Nancy. (2013). The afterlife of Piet Mondrian. University of Chicago Press: Chicago. (b:) Housley, Kathleen L. (2001). Emily Hall Tremaine: Collector on the cusp. (Direct to pdf online.) See particularly chapters five "The Victory Boogie-Woogie" and six "Painting toward architecture". (c:) Also, for a general PtA exhibition and PtA-era overview, see: Preece, Robert. (July-August 2017). Rethinking "Painting toward architecture" (1947-52). Sculpture magazine, 36(6), pp. 18-21. (Linked above is an online reprint of this article.) Further, see the introduction / first section of this article. [FN3] (c. 1984). Documentation: Overview and dates of Dec. 1947-1950 PtA shows at other venues, some PtA-loaned works to other shows during a Dec. 1947-52 time period (not complete), and the 1952 exhibition at Wellesley [not including found 1951 venues]. Wadsworth Atheneum archive (could be in Painting toward architecture file or the 1984 Tremaine Collection show file). However, it is unclear exactly when this document was made, who was consulted, and to what extent it was fact-checked. For example, dates vary compared to other evidence, works in PtA that took breaks to appear in other shows are not fully listed, etc. Also, the document states, "Piet Mondrian’s Victory Boogie Woogie was one of the several paintings and pieces of sculpture that toured the country." This is literally accurate, but within the somewhat complicated VBW context, not so accurate. [FN4] See Housley, Kathleen L. (2001). Emily Hall Tremaine: Collector on the cusp. (Direct to pdf online.) On p. 88, see an illustration of an analytical chart. On pp. 80-81, Housley writes, "They asked Fine to complete two paintings, the first a precise copy and the second an interpretation, based on a thorough analysis of the painting, in which the unfinished work would be completed." On the following page, "To compound the enormity of the undertaking for Fine, Emily wanted her to do a complete analysis of the painting accompanied by meticulous annotated charts." See references to letters, apparently transferred from the Emily Hall Tremaine Foundation archive to Box 4, Folder 27-30, "Mondrian, Piet, Perle Fine, circa 1945-1998", Artist Files, 1936-2000, Emily Hall Tremaine papers, the Archives of American Art, Smithsonian Institution, Washington, DC. [FN5]. See FN2a, Troy’s book. Also, see p. 55 showing a photo of Perle Fine making the copy / oil transcription (1947); p. 57 showing her completed "interpretation" (1948) and also a chart (1948). [FN6]. Preece, Robert. (1999). The problematic discourse on "Philippe Starck’s" Delano Hotel. MA dissertation, Birmingham Institute of Art of Design, UCE, Birmingham, England. [FN7] (a): See FN2a, Troy’s book, p. 54 and chapter FN122: (24 April 1948) Glarner to Dreier. Box 15, Folder 409, Dreier Papers. Beinecke Rare Book and Manuscript Library, Yale University. (b): See FN2a, Troy’s book, p. 54 and chapter FN124: The documentation of the wall label is footnoted by Troy to have been sent by biographer Kathleen L. Housley, who also wrote: Tranquil power: The art and life of Perle Fine (2005). Midmarch Arts Press: New York. (c): See FN2a, Troy’s book, p. 56 and chapter FN128: (11 May 1948). Rathbun to Fine. Troy received this from Hans Janssen. [FN8] Ibid. Also see chapter FN129. [FN10] See FN2a, Troy’s book, p. 56 and chapter FN127: (18 May 1948). Glarner to Dreier. Box 15, Folder 409, Dreier Papers, Beinecke Rare Book and Manuscript Library, Yale University. (See p. 237). [FN11] To specify moreso Rathbun’s time at the Miller Company, see the correspondence at the Bentley Historical Library at the University of Michigan: (2 March 1948). Mary Chalmers Rathbun, Miller Company, to Helen B. Hall, University of Michigan; and (29 November 1948) Emily Hall Tremaine, Miller Company, to Jean Paul Slusser, University of Michigan. In this letter, EHT states that Rathbun is no longer connected to the company. [FN12] See FN2a, Troy’s book, p. 53 and FN120: Frederick S. Wight [director, Institute of Contemporary Art] to Emily Hall Tremaine, 6 January 1948, folder: Restorations re: Victory Boogie Woogie, Emily Hall Tremaine Papers. First, the letter states, "We will send the Boogie-Woogie right on to the Miller Company at the conclusion of the show as you request. Another colored square has dropped down to the bottom of the picture by now, and I am sure you are wise to get the painting restored soon." I think it’s possible the year is actually "1949"; perhaps Wight made an error as some people do after the New Year. [FN13] See FN3, (c. 1984). Documentation: Overview and dates.